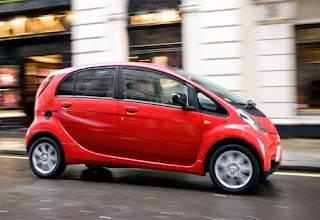 The first nine electric drive cars to become eligible for the Plug-in Car Grant of up to £5,000 (US$7,900) in the UK are: Mitsubishi iMiEV; smart fortwo electric drive; Peugeot iON; Citroen CZero; Nissan Leaf; Tata Vista EV; Toyota Prius Plug-in; Vauxhall Ampera and Chevrolet Volt. More will follow next year. As announced at the Spending Review, the UK Government has made provision of more than £400 million (US$630 million) to promote the uptake of ultra-low carbon vehicle technologies. This includes approximately £80 million (US$126 million) supporting research and development activities; £20 million (US$32 million) for the installation of infrastructure; and, subject to review, provision of around £300 million (US$473 million) to support consumer incentives for the life of the Parliament. The first review of the Plug-In Car Grant will take place in 2012. The level of the Plug-In-Car Grant has been agreed until 31 March 2012. The level will be reviewed in January 2012, taking into consideration a number of key factors, such as the costs of vehicles and the development of the early market. The level will then be set for subsequent years. £43 million (US$68 million) has been made available up to the end of March 2012.